ENTER THE GOLD BUCKLE CHALLENGE! 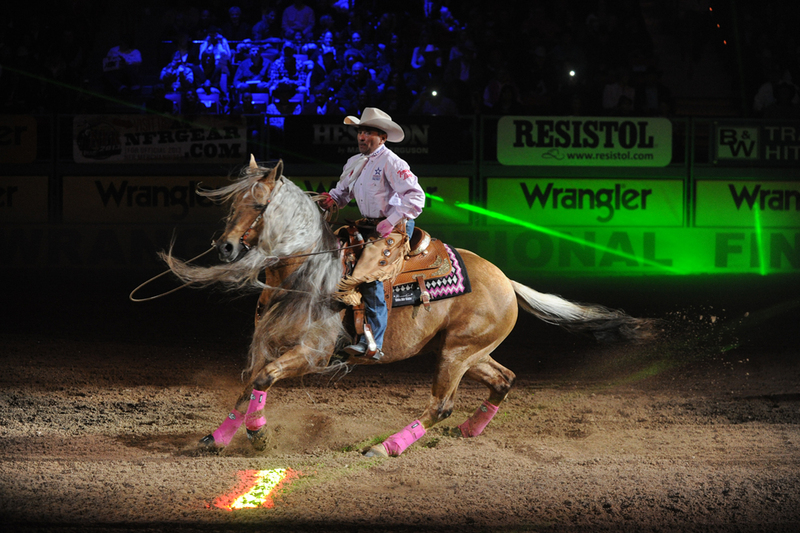 Sign up to receive Purple Cowboy emails and you'll be entered for a chance to win two GOLD BUCKLE tickets to one night at the 2018 Wrangler National Finals Rodeo in December! Fill out the form below to sign up for the Purple Cowboy mailing list and be entered. By entering your email you are opting in to the Purple Cowboy email list. Purple Cowboy will only send you updates about the brand. Eligibility: The “PURPLE COWBOY GOLD BUCKLE CHALLENGE” (“Sweepstakes”) is open only to any United States residents able to attend the Wrangler National Finals Rodeo event in Las Vegas, NV, between December 6-18, 2018 at the Thomas & Mack Center. You must be 21 years of age or older at time of entry and able to attend the event and make use of the tickets. If you are unable to do so, you automatically forfeit your win to an alternate winner. The Sweepstakes is void in any state where prohibited or restricted by U.S. or local law. Sponsor and Administrator of this sweepstakes are in no way responsible for any additional expenses incurred getting to or from the event. Any individuals (including but not limited to employees, consultants, independent contractors, and interns) who have, within the past six months, performed services for Sponsor, Administrator, any organizations responsible for sponsoring, fulfilling, administering, advertising or promoting the Sweepstakes or supplying the prizes, and/or their respective parent, subsidiary, affiliated and successor companies, and immediate family and household members of such individuals, are not eligible to enter or win any prize. “Immediate family members” shall mean parents, step-parents, children, step-children, siblings, step-siblings, or spouses, regardless of where they live. “Household members” shall mean people who share the same residence at least three months a year, whether related or not. Sweepstakes Schedule: The sweepstakes is a simple sweepstakes. You submit your entry for a random drawing. The randomly chosen winner will receive one (1) pair of tickets to one night at the 2018 Wrangler National Finals Rodeo, December 6-18, 2018 in Las Vegas, two (2) roundtrip airfare tickets and lodging for two (2). The entry period begins on or about 12:00:01 a.m. Pacific Standard Time (“PST”) on 9/27/18 and ends at 11:59:59 p.m. ET on 11/9/18 (“Entry Period”). Sponsor’s computer is the official clock for the Sweepstakes. No online entries will be accepted after 11/9/18. All entries must be made through the shortstack entry form. Entries made by email or via social media messages will not be eligible. A winner for the sweepstakes will be announced the week of 11/12/18. How to Enter: Enter your contact information on the entry form at https://goldbuckle2018.shortstack.com/p3Rd6R. You must complete the entry form in its entirety to be eligible for the random drawing. Lack of completion automatically disqualifies the entry. All sweepstakes entries must be received by 11:59:59 pm PST on 11/9/18. Entrant further warrants and represents that he/she has fully complied with these Official Rules. Limit one (1) Sweepstakes entry per household. Multiple entries in excess of this limitation will only be counted once. Mass entry attempts will result in disqualification of all entries by such household. Selection: During the Sweepstakes Period, all online entries will be stored in a secure spreadsheet on the Wildfire Application website. Submissions to the sweepstakes begin at the start of the Entry Period and ends, 11:59:59 p.m. PST on 11/9/18. Once submissions are closed, a winner will be chosen at random on 11/12/18 at 8:00 am PST using the random number generator Random.org. That winner will be notified via email and given four (4) hours to respond. If there is no response or if the winner chosen cannot attend the event between December 6-18, an alternate winner will be chosen. The same process will continue to take place until a viable winner is selected. If no viable winner is chosen by close of business 11/12/18, the tickets will be forfeited and returned to the Sponsor. Prize is two (2) Gold Buckle tickets to the Wrangler National Finals Rodeo, two (2) roundtrip airfare tickets and lodging for two (2) worth approximately $2500 US in total. Delivery of the tickets to the winner will be managed by Vintage Wine Estates and winner may need to show identification to retrieve tickets. Potential Prize winner will be notified by e-mail only using information provided at initial registration. Due to fast turnaround needed for dispensing the prize, four (4) hours after notification and/or return of e-mail notification a chosen winner may be disqualified and an alternate winner chosen. Potential Prize winner will be required to accept the tickets via email and confirm they can use them to receive an Affidavit of Eligibility, Release and Indemnification, and a Publicity Release where allowed by law. If the Affidavit of Eligibility, Release and Indemnification and Publicity Release (or any other required documents) are not returned to Sponsor within specified time period, potential winner will be disqualified and an alternate winner selected from all remaining eligible entries received. The alternate winner will also be chosen randomly. In the event of any dispute concerning the identity of any online entrant, the entry will be deemed submitted by the natural person who is the authorized holder of the transmitting e-mail account. “Authorized account holder” is defined as the natural person who is assigned to an e-mail address by an Internet access provider, online service provider, or other organization (e.g., business, educational institution, etc.) that is responsible for assigning e-mail addresses for the domain associated with the submitted e-mail address. Winners List: For the names of the winner, email info@winesisterhood.com and provide your name and full mailing address. Requests must be made before 12/1/2018.